Metals such as brass, copper, chrome, aluminum, bronze, pewter and stainless steel do not require the use of toxic or abrasive commercial cleaners. Most homemade polishes use a natural acid such as vinegar or lemon juice combined with a base such as flour, cornstarch or baking soda to make a polishing compound. Salt is sometimes added as a scouring agent. A polished, shiny stainless steel sink. An example of a polish mixture for metals used around the home is equal parts salt, plain flour and white vinegar mixed into a paste, then spread over an item and left to dry for 1-2 hours. Lemon juice is a good substitute for the white vinegar, while corn starch or baking soda can replace the flour. Chrome responds well to cleaning with a single, unmixed substance such as baby oil or vinegar, while copper cookware can handle scrubbing with a lemon wedge sprinkled with salt. For stainless steel items, rub the item directly with a cloth soaked in olive oil or undiluted white vinegar. 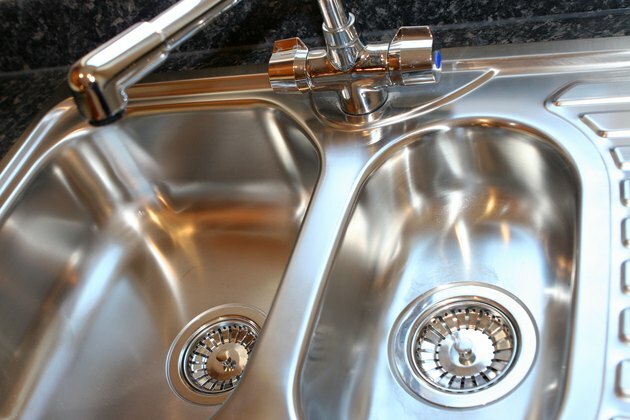 In larger areas such as a stainless steel sink, use a cloth saturated with club soda. To restore strong metals, such as brass, that are deeply tarnished or have grooves and etching, soak the item for about 5 minutes in a solution of 1 ounce citrus acid dissolved in 3 quarts hot water. Scrub lightly with a toothbrush and dry promptly to avoid water stains. To remove smaller tarnished spots on brass, bronze or copper, use a dab of ketchup on a soft, clean cloth and rub gently.